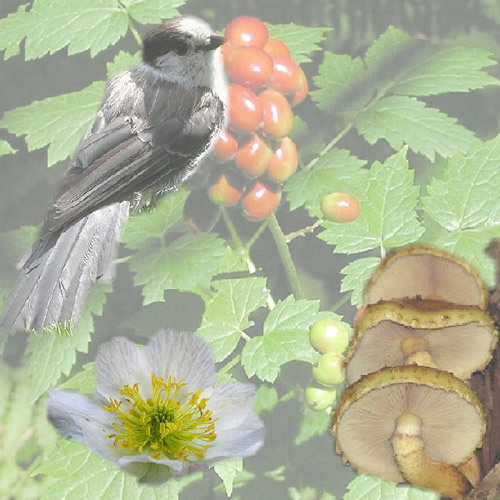 The months seem to be slipping by quickly, and here we are once again with another edition of Whispers - the newsletter of your favourite nature site on the web - Dereila Nature Cyber Inn. To our new subscribers we bid you a hearty welcome and thank you. You are part of a growing community of nature lovers and we invite you to get involved in any way you can. Although this isn't the best time for bug viewing in our part of the world you might still like to check out the latest section at the Inn - a visual guide to some of the most popular groups of bugs. We hope you'll enjoythis new section and that you'll get a better appreciation of the world of bugs. When we started the Dereila Nature Inn our vision was one of a community of nature enthusiasts exchanging ideas, stories, tips and images. This month we invite everyone to submit images to this section of our newsletter. Be it bugs, birds, wildlife or wildflowers - they're all welcome! 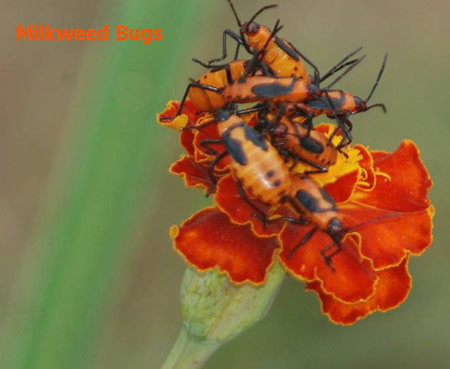 This month's image of immature Milkweed Bugs was submitted by Steve Slayton. Steve has also made important contributions to our State and Provincial Birds page. Milkweed Bugs are part of the order of insects known as True Bugs. To learn more about these insects, visit out new guide to Bugs section by clicking here. Visit each page by clicking on the image. Special thanks to Judy of San Carlos, California for suggesting this month's bird and providing the images. We invite you to visit The Birder's Place - a social network and forum just for Birders. This forum is just getting going, so please drop by and jelp us get things rolling. You'll get a chance to meet other birders, exchange stories and upload and share your images. Just click on the image above to start your visit. You may enjoy cooking with mushrooms and perhaps have encountered some interesting species on your travels. If so, hopefully you'll enjoy the next new section we're working on which will explore the world of fungi. Stay tuned! If you're a new subscriber to Whispers you might be interested to know that past issues are available online - simply click here. We upload the issues as new ones are released, so as you receive this edition we will be uploading October's issue. The autumn months bring us more than the changing of the leaves in our forests and wooded areas. Now is a fine time to explore the forest floors and crevasses for fungi. Casual walkers often fail to see the diversity of this intriguing species of life. For this reason, this month we draw your attention to two species of this fascinating group. 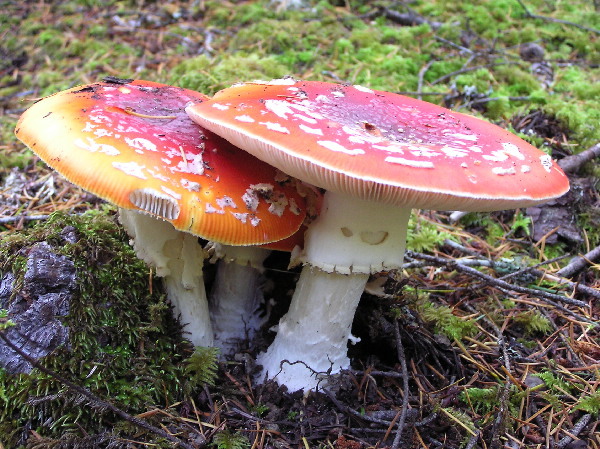 The colourful Fly Agaric, Amanita muscaria is a common mushroom throughout coniferous and some deciduous forests throughout the Northern Hemisphere. There are several colour and shape variations, but all have white patches on the cap. 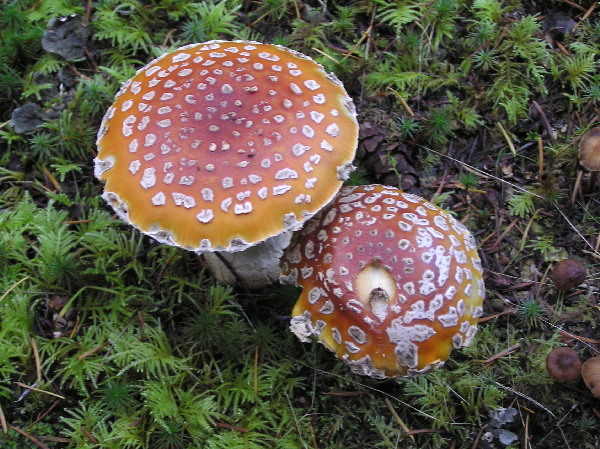 Many people consider this to be the most typical of mushrooms frequently drawn in cartoons and fairy-tales. Pretty as it may be - beware for it's highly poisonous and has hallucinogenic properties. 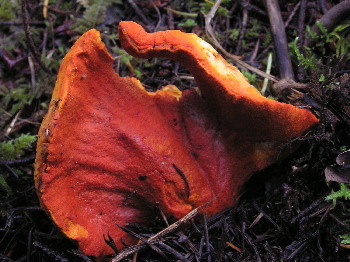 The second choice is the brightly colored Lobster mushroom, Hypomyces lactifluorum which is not really a true "mushroom" but rather a parasitic fungus which grows on other mushrooms. Its name is derived from the similarities between its colours and that of cooked lobster. 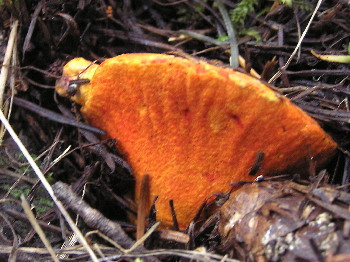 Lobster mushrooms are widely eaten and can be found in some supermarkets. This month we drop by Vermillion Lakes in Banff National Park, Alberta. Banff's Mount Rundle is graced with a fresh sprinkle of snow in this picture taken on a spectacular autumn day. Vermillion lakes are an easily-accessible string of lakes near the town of Banff. As the years pass by though, the lakes are gradually evolving into wetlands and will gradually disappear altogether as bushes, scrubs and trees gradually invade. The changing seasons bring different colours to this fascinating place in the mountains. Enjoy a virtual tour at the Inn's page on Banff National Park simply by clicking here.